Audra Ellison has no idea why she’s had her memory wiped clean, only that she chose to erase her past to protect someone else. But soon, a handsome stranger tells her she’s special. Unique. That she has the power to influence the minds of others. And that her life is in danger. She soon discovers that she is the descendant of a serial killer, the infamous “Blood Countess” Elizabeth Bathory, and that she, like all her relatives for generations, is being hunted for the sins of her ancestor. She also discovers that she erased her memory to forget something important—important not only to her, but to those who want to see the line of Bathory ended for good. Reunited with others like her—young, powerful Progeny living defiantly on the edge of extinction in Europe’s underground—she is hounded by danger at every turn and driven deeper into the inner circles of two ancient orders intent on destroying one another with a weapon only Audra can find. And as those around her start disappearing, Audra realizes the only thing that can save them all is piecing together a past she no longer remembers. As she works to unravel the web of secrets and lies, Audra is thrust into a world of faith and doubt, of truth and deceit, of life and immortality, and she must decide who to trust—and what to believe. What she ultimately uncovers will change everything she thought she knew about who she is and what her lineage means. A kaleidoscopic thriller that brings the underground world of the ancient cities of Eastern Europe to life like never before, The Progeny is a taut, breathless story of centuries-old intrigue and modern love and forgiveness. “Tosca Lee is a masterful storyteller who has created a rich and engaging tale of adventure, mystery, and loyalty in the face of perpetual betrayal, which kept me on edge from the first page until the last." 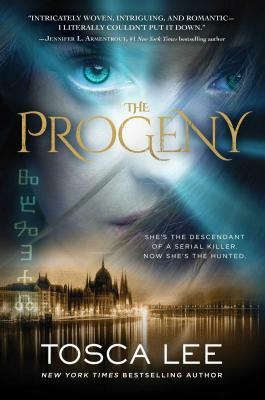 "Dark, tense, and gripping, The Progeny by Tosca Lee has all the ingredients thriller fans crave." "Tosca Lee's The Progeny delivers a riveting ride from page one. Historical codes, serial killers, and whirlwind global travel just begin to frame this tale. I galloped through the book and at the end wanted more. Sequel please?!" "If you are into books that are well written, fast paced, with changes of direction and not knowing who can be trusted, then make sure you pick up Tosca's newest." "[A] complex thriller with various turns and twists...A great choice for readers who enjoy theirpsychological thrillers with a historical twist." "Danger lurks around every corner in The Progeny, and I love the various surprises Tosca Lee gives us. This is the first book I've read by Tosca Lee but I guarantee it will not be the last! The Progeny is definitely a winner and easily recommended."